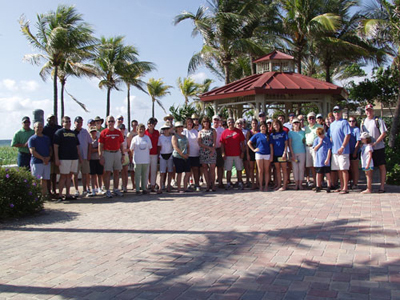 The Florida Bankers Association cleaned the beaches of Lauderdale-by-the-Sea, FL, as part of their 2012 Service Project. (Left to Right) – Commissioner Mark Brown (LBTS); Eileen Nesdale (NSTSTF); FBA Vice President, Kenneth Pratt; Helena Schaff (NSTSTF); FBA Executive Vice President, Anthony DeMarco; Mayor Roseann Minnett; State Senator Ellyn Bogdanoff; FBA President and CEO, Alex Sanchez; and FBA Chairman, Greg Bryant. What an amazing Monday morning on the beach at El Prado Park’s Pavilion in Lauderdale-by-the-Sea, Florida. 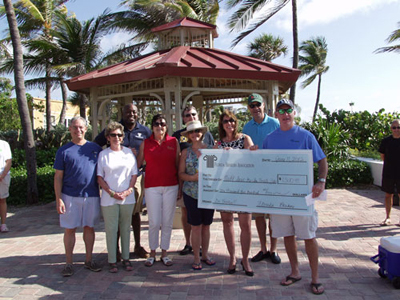 The Director of Communications, Renee Thompson, along with representatives from the Florida Bankers Association arrived for a beach cleanup and had contacted Mayor Roseann Minnett to determine what organization was most deserving and qualified to receive the Association’s $1,500.00 donation. Mayor Minnett selected the National Save the Sea Turtle Foundation, the organization most active in the community’s education, protection and public awareness programs to receive the gift. Alex Sanchez, President and CEO of the Florida Bankers Association, presented the check to Board member, Helena Schaff, and Program Manager, Eileen Nesdale. State Senator Ellyn Bogdanoff and Commissioner Mark Brown also attended the presentation. We are pleased to not only receive the gift, but it is wonderful to know that our Florida Bankers are concerned about environmental issues. The Foundation thanks you. Keep up the good work!